We are fully into cozy season, friends! December has brought us cold days and colder nights, and frankly, all anyone around here wants to do is curl up on the couch with a cup of hot tea and a book. When Page One Books reached out to us about trying out their Cozy Reader Bundle this season, of course we said yes, and honestly I think this is the one of the best boxes we’ve ever been gifted. Do you guys have any cozy essentials? We’ve been talking about ways to cozy up your reading space lately, and this box hit a lot of our must-haves. A big box showed up, and after a few quick swipes of a knife, we had it open and found ourselves unwrapping perfect item after perfect item, all from brands we know and love. An Obvious State mug? Yes please! 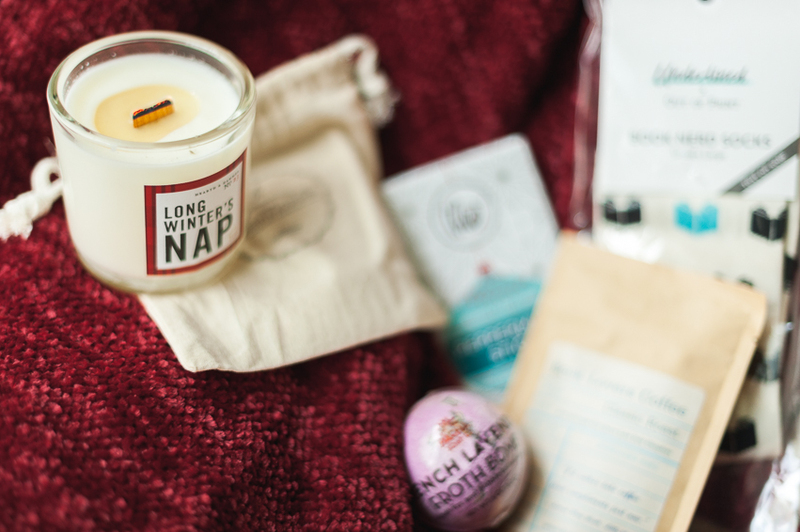 Coffee, bath bombs, bookish socks, chocolate and candles? Double yes! And a book, of course a book. Half the fun of Page One is that they hand select a book for you, and if you’ve already read it, or own it, no problem, just let them know and a replacement will be sent out at no extra charge. We received a copy of Christmas Pudding and Pigeon Pie by Nancy Mitford, a humorous classic we are both excited to dive into this season. You all know how much we love a good classic! This box provided everything you could possibly need to have the warmest, coziest reading evening (or morning, if you’re Rikki) of your life. Plus, it’s available for easy holiday gifting if you have someone bookish on your list that could use some pampering and extra care. We love Page One for their ability to provide a true experience with their boxes, instead of just a random assortment of stuff you won’t really use. I can’t think of a better gift for a bookish friend or family member, especially if they’re the hard-to-shop-for type. Be sure to use code BIBLIO for 10% off and grab one just in time for the holidays! Subscription boxes have exploded in the last couple of years, but so many of them are just filled with...stuff. Which, frankly isn't our style. But give us a subscription box that offers a true experience? Yes, please! 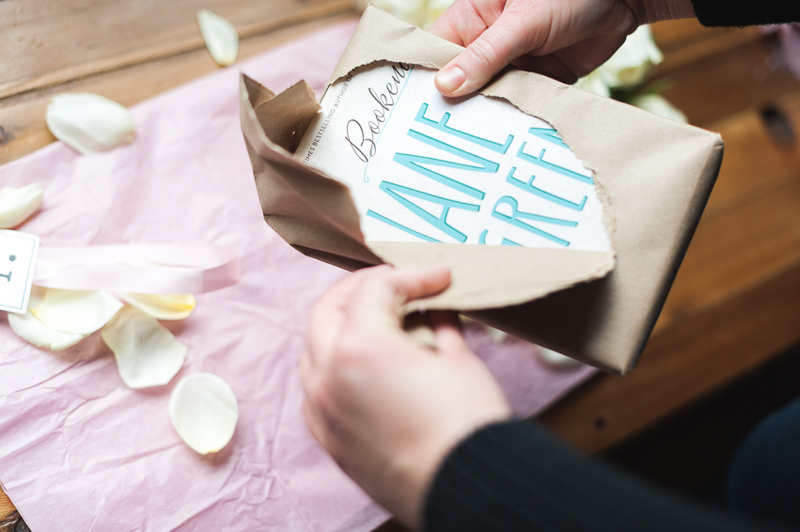 Page One Books recently gifted us their Valentine's box bundle to check out for ourselves. When we were opening the box together, my husband said, "So the idea is that a guy gets this for his girl, if she's into books?" - Yes. "That's actually a really great idea. And costs as much as anything else you'd get." Exactly! What a wonderful thing, to have such a talented small business creating such unique, perfectly giftable experiences! The opportunity to treat your loved one, or yourself, to a bookish box of goodies that is just right for the holiday or season, is priceless. When first opening the box, you're greeted with a cheerful list of all the goodies contained, and a fluffy pink mass of individually wrapped presents. It is so fun, and so welcoming; it was a perfect presentation. 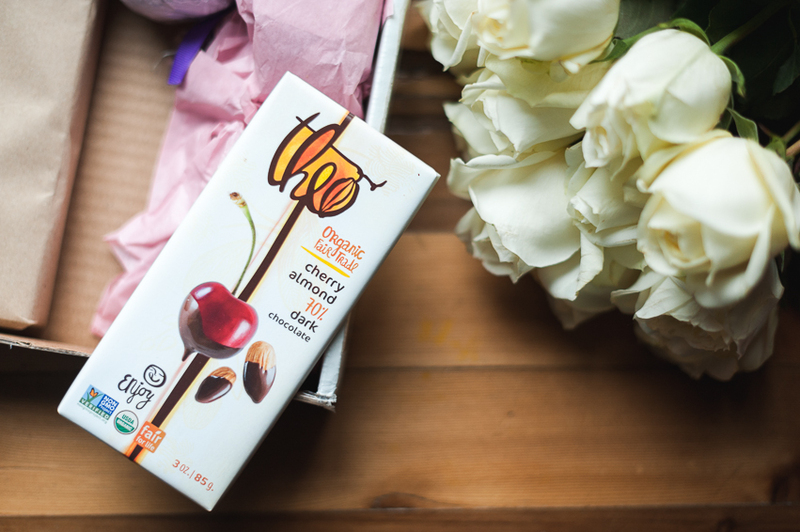 Once we finished delighting over each item, it was time to put them into action and set up a memorable experience. You all know how much we love to create a great atmosphere around here, and this was a perfectly delivered piece of self-care on a gray drizzly PNW afternoon. How can any lady (or gentleman) resist enjoying a relaxing warm bubble bath, glass of wine, candles, and a great book? Imagine the look on their face when you surprise them with a setup like this for Valentine's day (or any day, really)! It's an opportunity to take those last minute flowers and chocolates to the next level, and you can use our discount code ARDENT15 if this box looks like something that would delight the book lover in your life. Hey husbands, are you seeing this?! :) hint, hint! Thank you so much, Page One Books for this fantastic gift! We were absolutely thrilled to explore the contents and see, first hand, the thought and effort put into it. Well done! *We were sent this box in exchange for an honest review, and of course, all opinions are wholly our own, and you can see our policy right here!